One of our hiking buddies once commented that given the right mood and ambition, he might go on a Richard Hike. And under the same conditions he might go on a Ray Hike. But he would never, ever go on a Richard and Ray Hike! We took it as a compliment. Sadly, my Trail Brother Ray recently passed away and all I've been thinking about is the wonderful adventures we shared in such a short time. We've hiked not only in beautiful weather but have hiked, camped, and backpacked in rain, sleet, snow, ice, thunder, lightning, and gale-force winds. We hiked not only in our Umpqua National Forest but we also trekked in Washington and California, visiting many a remote wilderness area in the process. We slapped at mosquitoes and blackflies, danced away from rattlesnakes, and fought off marauding deer. We walked on beach sand, rocky trails, snow drifts, volcanic ash, and waded across many a creek or river. Sometimes we hiked where there were no trails at all. And all the while, a steady dialogue of good natured insults were directed at each other. And of course, there was "The Ray", his signature pose where he raised his arms and hiking poles overhead, usually in triumph and glory atop a mountain summit. It seemed like every hike was epic and most certainly were memorable. When we did not hike with each other, we hiked where the other had not yet been. Upon returning home, the taunting began with "Guess where I went today?" emails going back and forth. It was a ritual of sorts where the tauntee would complain to the tauntor about tainting the trail for future use. 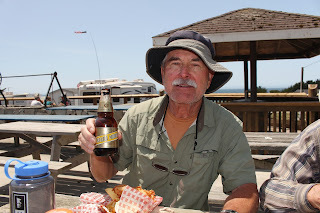 Ray and I had talked about doing a weekend backpack trip on the Pacific Crest Trail from Mount Ashland Meadows to Wrangle Gap but for whatever reason, we never pulled it off. 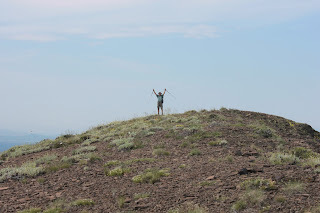 We also talked about hiking to Siskiyou Peak as a 12'ish mile out-and-back day hike. And one particular day I did do that very thing and got to taint the trail for Ray. Later on, he did the same hike and shared his pictures with me and even though I had already been, it still felt like a taunt and taint. So, when the Friends of the Umpqua went hiking on the slopes of Mount Ashland, I went along not only for the magnificent hike, but also to reminisce and to mourn the loss of a good friend. The Pacific Crest Trail doesn't care about all that though, it just lays on the ground and lets people walk on it from Mexico to Canada or vise versa. 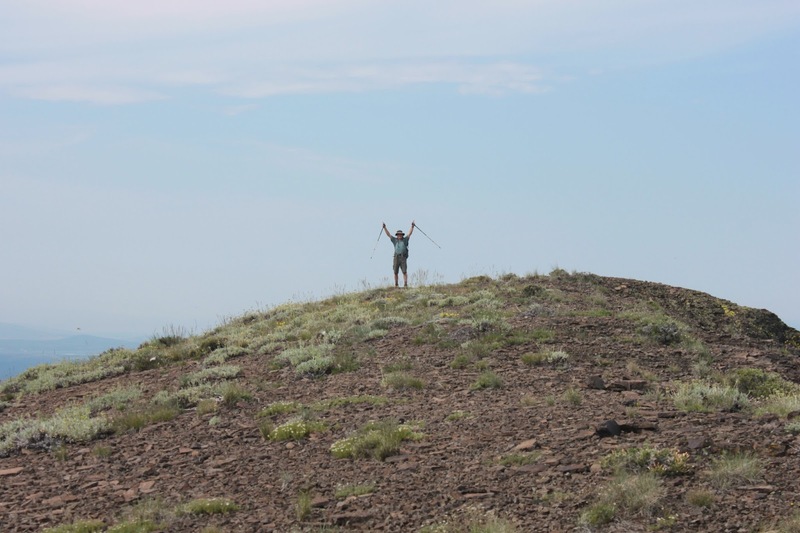 The PCT thru-hikers usually hit Oregon late July and we encountered many thru-hikers who were easily distinguished by long beards, unshaven armpits, dirty clothing, and a certain air about them that lingered in the forest long after they passed by. And the men were just as bad! From the paved Mount Ashland Road, the PCT headed through a beautifully shaded forest comprised of tall conifers of various ilk. At the outset, the route took us through several small meadows in a foretaste of the magnificent meadowy goodness yet to come. The meadows were buzzing with bees harvesting pollen from the flowers. The trail was fairly level with gently rolling ups and downs and I sure love a trail with no mosquitoes on it. After a mile or so, the trail crossed a dirt road and contoured across a rather large meadow clinging to Mount Ashland itself. Hellebore (also known as corn lily) was putting on a show along with sneezeweed, orange agoseris, tiger lily, and mountain owl's clover. Mount Ashland's profile (with a white microwave dome thingy on it) was photogenically etched against a dark blue sky. The trail did enter the dark forest again but the trend was towards more meadow and less forest to the point where it would be all meadow and no forest. Grouse Gap is the grassy bowl where the transition to meadow becomes complete. Numerous springs and creeklets ran across the trail and the vista of green slopes and distant mountains and valleys was pretty awesome. The Siskiyou Mountains figuratively dropped away at our feet, providing nice views of the Shasta Valley with Mount Shasta lording its snow-capped peak over us lesser beings. John, Edwin, and I said good-bye to the hiking club at Grouse Gap and performed a short bushwhack on a pumice barren back up to the PCT. The Mount Ashland lupine, a miniature lupine endemic to the area and found nowhere else, covered the slope in half-inch high mats of grayish leaves and purple flowers. We made sure not to step on the rare and endangered lupine as we hiked up but the grasshoppers apparently find the plant quite tasty and don't care about the rarity thereof. From Grouse Gap, the trail charged up a rocky cliff that had snow patches under the trees. However, the slope was relatively short so the uphill agony was short-lived, plus it offered a nice view of Mount McLaughlin's tip. And always, Mount Ashland was eminently visible across Grouse Gap. The three of us thought we were hikers extraordinaire until a young lady passed us by, out for a casual 20+ mile trail run. After bidding her adieu, we old and decrepit hikers adjusted our canes and walkers and bravely continued on, at our aged snail's pace. We called it good at Peak 7079, which was just short of Siskiyou Peak but still a respectable 10+ mile hike. We scrambled up to the top which sounds impressive until you consider the summit was only about 10 feet higher than the trail. But hey, that's how old mountain climbers roll! The terrain here was sparse and treeless so from the relatively small peak, we enjoyed the ho-hum, rather usual stunning vista to Mount Shasta and the rest of California. The view to the south was new and it was Oregon too, so naturally it was more beautiful. Wagner Butte lay immediately to the south and we could trace our route on nearby Mount Ashland. Several other peaks on the crest of the Siskiyous loomed to the southwest, notably Siskiyou Peak, Big Red Mountain, and Observation Peak. And don't you know I want to backpack the Siskiyou Mountains crest one of these days. Music floated up from a nearby spring in form of tinkling cowbells on a herd of cattle grazing in the hellebore. On the way back, the shadows lengthened in the forest and the meadows were bathed in the afternoon glow. I'd like to say that I put Ray to rest but that'll be a process that will take a lot longer than a mere 10 miles of trail. Let's just say he was sort of with me this day and wherever he is, he'll swear I tainted this particular section of the Pacific Crest Trail. Miss you, Trail Brother. So sorry about the loss of your hiking buddy. What a lovely tribute! I'm sorry to hear about your hiking partner and friend Ray. My main hiking partner for recent 3 years passed away last fall.